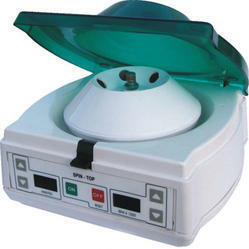 Manufacturer of a wide range of products which include mini digital centrifuge , brushless model t-1. Maximum Speed 10000 rpm Spin-Top with 2 heads 6 x1.5ml and 12x0.5ml tube. Microprocessor based digital timer, digital rpm and speed control from 1000 rpm to 10000 rpm in 10 steps. Fitted with imported motor from USA without carbon.